Earlier this month, I posted (here) about a young woman named Ariel who had F-Holes tattooed on her inner left forearm. Brian didn't give me much more information (i.e. artist, shop, etc. ), but I appreciate him allowing me to share these F-holes here on Tattoosday! Along with Mark, I met the artist, Jinx, from Gameface Tattoos in Orlando, Florida. The piece represents about 48 hours of work and, as for its meaning, Mark said that he and Jinx "just really wanted to do a sculpture." Thanks to Mark and Jinx for sharing their work here on Tattoosday! 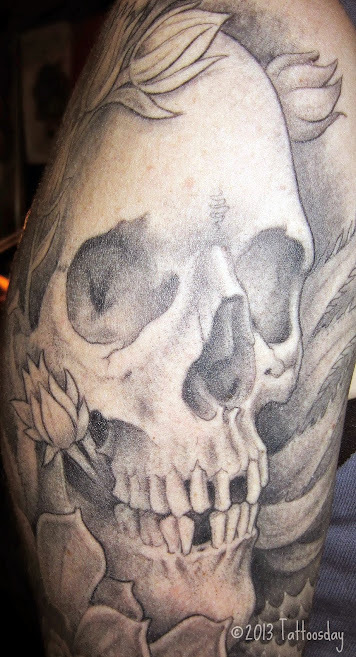 Carlos told me that this tattoo was inspired by his appreciation of the Buddhist way of thinking. It's a great black and gray piece, with that extra pop from the color from the cherry blossoms. He credited Needles at East Side Ink in New York City. Needles' work has previously appeared on Tattoosday here and here. Thanks to Carlos for sharing his tattoo with us here on Tattoosday! 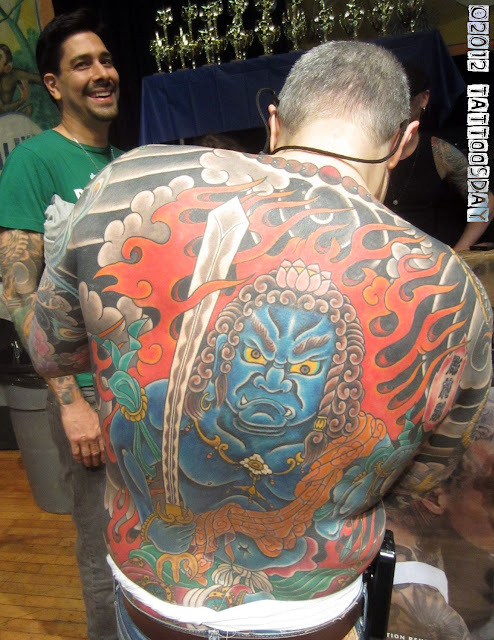 One of the great things about tattoo conventions is that you get to see more back pieces than you would say, walking the streets of New York. This huge tattoo belongs to Barbara, who was working at the Mad Science Tattooing booth at Roseland. She credited the piece to one of the artists Leslie Reesen, who was working the convention. Mad Science is located in The Hague in the Netherlands. 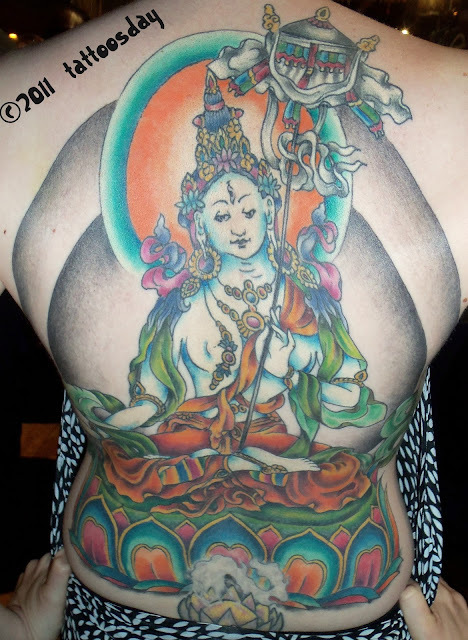 She was happy to share this back tattoo which represents about 55 hours of work (and extends below the waist line). Barbara explained a little about its origin. "I wanted to do the Leaf Man, the face with all the leaves ... I really like it ... I gave him [Reesen] a free hand about the design, so it's really his own drawings ... There's one detail that I really like, because I used to be a ballet dancer and, in Wicca ...the leaf man is the god of the dance so maybe that's why I always liked the Leaf Man, I don't know, or it's more coincidence...". Thank you to Barbara for sharing her Leaf Man back piece with us and, in so doing, helping introduce me to the talented artists from Mad Science in the Netherlands, especially Leslie Reesen! 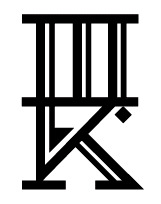 This entry is © 2009, 2013 Tattoosday. There's a guy I've seen around for the past couple of years who I've been dying to ask about his tattoo. He credited this Celtic cross to Needles at East Side Ink, in New York City. We'll have something else later in the week by Needles, as well. Thanks to the gentleman above for sharing his head tattoo with us here on Tattoosday! I'll be honest, koi tattoos are pretty popular, so I don't often post photos of them. But, every once in a while, I see an exceptional one, and feel compelled to share it here. The photo above is of a stunning koi tattoo, courtesy of a guy named Chris, who I met last week at the NYC Tattoo Convention. It's an exceptionally well-done piece, with the traditional Japanese carp, or koi, swimming upstream, along with a lotus flower at the bottom and cherry blossoms at the top. Note also the way water and movement is skillfully represented. 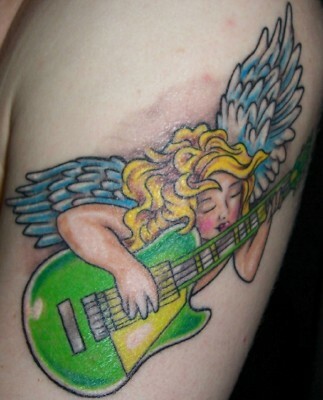 Chris credited Jeremy Miller from Screamin' Ink Tattoo in Fair Lawn, New Jersey. Note: this is a different Jeremy Miller than the one who competed on the first season of Ink Master. I usually see something spectacular from the talented crew at Screamin' Ink every year at the convention, all of which can be seen in previous posts with their shop tagged here. Thanks to Chris for sharing this great sleeve with us here on Tattoosday! I met Jeffrey at this year's New York City Tattoo Convention last weekend, and he shared the above tattoo, one of a dozen famous portraits he has adorning his body. That is, of course, Jimi Hendrix. Jeffrey told me, "I just love black and gray portraits," and that the shading was so intense on this piece, that at one point he passed out in the middle of getting it, which took about nine hours to complete. He credited the artist Kris Busching at Undead Ink in Oceanside, New York. 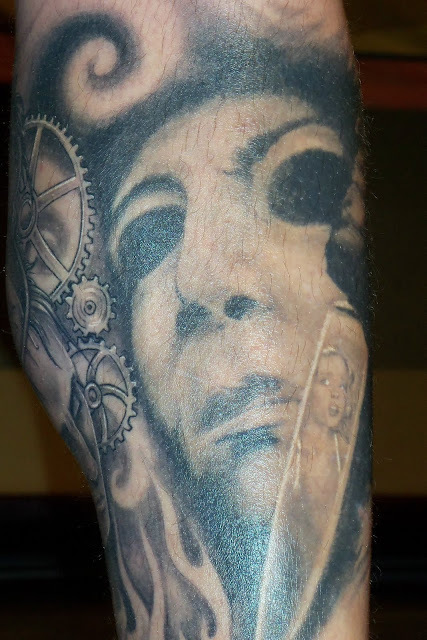 Thanks to Jeffrey for sharing this amazing portrait with us here on Tattoosday! 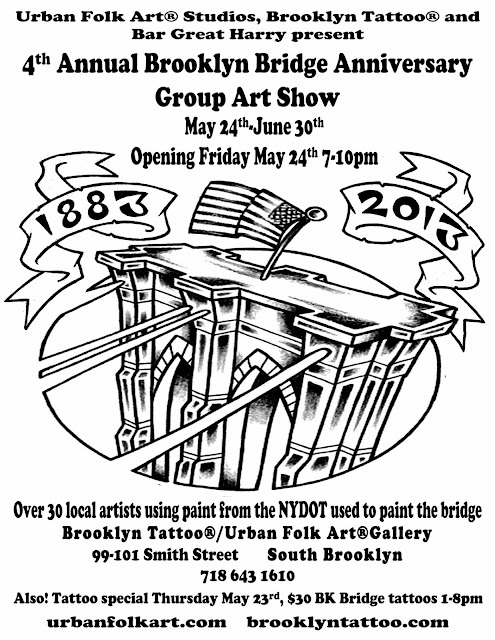 Celebrate the Brooklyn Bridge at Brooklyn Tattoo and Urban Folk Art® Gallery! The Brooklyn Bridge, an icon that represents our borough, was completed 130 years ago and the good folks at Brooklyn Tattoo and Urban Folk Art® Gallery are hosting their fourth annual celebration in honor of the anniversary. "Those interested in receiving a Brooklyn Bridge themed tattoo can show up at the shop-Brooklyn Tattoo®, 99 Smith Street, Brooklyn, and pick from several flash (pre-drawn) images that evoke the spirit that has defined New York’s iconic skyline. 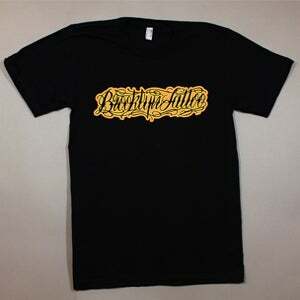 Tattoos will be done by several of the Brooklyn Tattoo® staff on a first come, first serve basis. 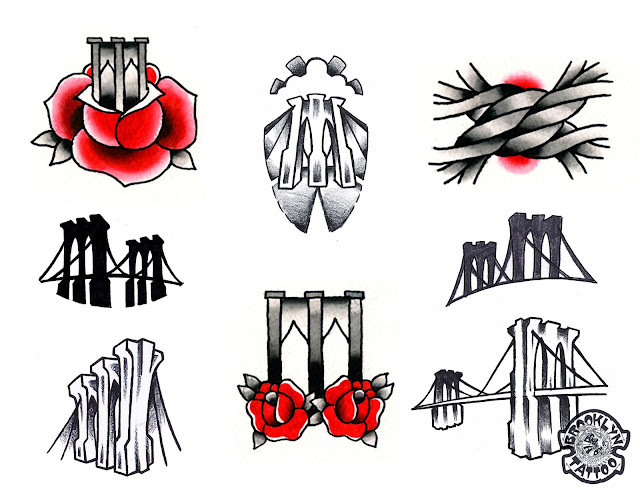 Also, for those not committed enough to join ink to skin, copies of the flash design sheets will be available for purchase as well as a limited edition book Adam Suerte put together showcasing 50 Brooklyn Bridge tattoos he’s done in the past." If you're not down for a new tattoo, you should definitely consider attending the opening of the art show, tomorrow, May 24, 2013. 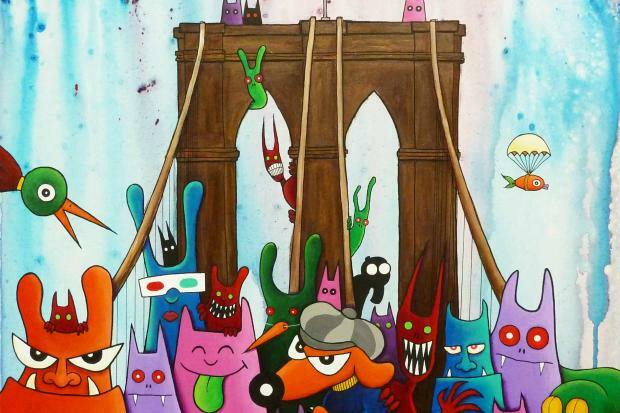 "Urban Folk Art® Gallery will be honoring the 130th anniversary of the opening of the Brooklyn Bridge with a group show of over 30 local artists of varying mediums. In their third show of this type, artists will be showing their homages to the bridge with one common element. In February 2013, curator and contributing artist Adam Suerte aquired five 5 gallon buckets of surplus paint from the NY Department of Transit that was used to do touch ups on the Brooklyn Bridge (http://cityroom.blogs.nytimes.com/2013/02/05/surplus-paint-from-the-brooklyn-bridge-now-could-be-yours/). 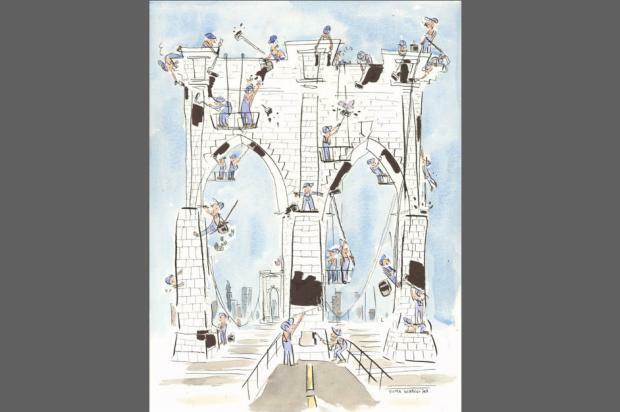 As an undying fan of the Brooklyn Bridge that is evident in his artwork, he was compelled to get some. Each artist in the group show will be using the 'Chocolate Brown Enamel' in some way within their piece. Painters, comic artists, graphic designers, photographers, screen printers, tattooers, graffiti artists, toy designers and artists of other mediums will be contributing. Suerte, as one of his pieces, has repackaged some of this paint in a limited edition quart size cans that will be for sale at the show. If you ever wanted to own a piece of the bridge, this could be considered pretty close. The show opens May 24th from 7-10." Even if you can't make the opening, the work will be on display through the end of June, so, if you find yourself in the Cobble Hill section of Brooklyn, you should definitely stop by and check out the amazing art! 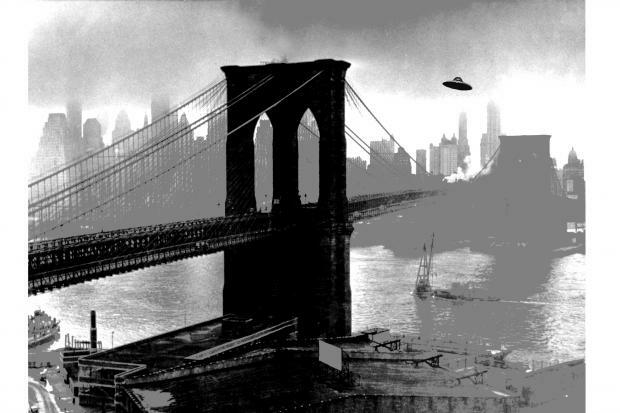 Also, if you get a tattoo, feel free to e-mail us a photo at Tattoosday@gmail.com, along with a sentence or two about why you wanted to get this Brooklyn icon inked on you, and we'll share it on the site some time in the next few weeks. Every year I attend, one of the highlights for the NYC Tattoo Convention is seeing the artist Bugs in action. He has taken tattoo art in a new direction, and his style is not only unique, but positively mind-blowing. That said, it was a wonderful moment when, while wandering about Roseland, I chanced upon one of his clients, in the form of Gina. I mean, really, how amazing is that? Gina is a huge fan of Bugs' work and has, in her words, "donated my body to him." This piece is in honor of her mom. She told Bugs the concept and she "let him take it any direction he wanted to go." 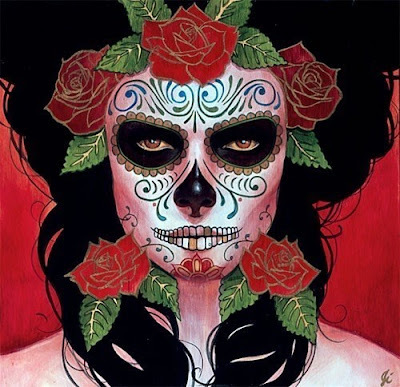 When I asked Gina about this piece, she elaborated, "
It's actually for me ... it's my interpretation of myself ... a Rubenesque woman ... and that's what he came up with." Bugs works out of Los Angeles, but he frequents many conventions, and is a regular at Roseland. Gina makes a point of seeing him every year he is here. Thanks to Gina for sharing her amazing work by Bugs here on Tattoosday! Be sure to visit Bugs' website here to appreciate more from this amazing artist!! This tattoo is based on the artwork of California artist Sylvia Ji. Jessica is an admirer of Ji's work and she collaborated with tattoo artist J.J. Claudio to recreate this piece on her arm. J.J. Claudio just recently joined the crew at Tattoo Frenzy in Lindenhurst, New York. Thanks to Jessica for sharing her lovely tattoo with us here on Tattoosday! My curiosity about the tattoo was not unfounded, when Hannah informed me this was the work of famed artist, Shawn Barber. Hannah hails from Southern California, and got this tattoo at Memoir Tattoo in Los Angeles. ... and the cactus flowers coming through the cheekbone ... I didn't really ask for flowers or anything and he put those in and that's one of my favorite parts... they're all succulents, like aloe plants and cactus ...". It is always a thrill to share work of people I meet who have been adorned by the creations of artists at the top of their game. If you want to see an amazing array of Shawn Barber's work, visit his web page here. Thanks to Hannah for sharing this incredible tattoo with us here on Tattoosday! 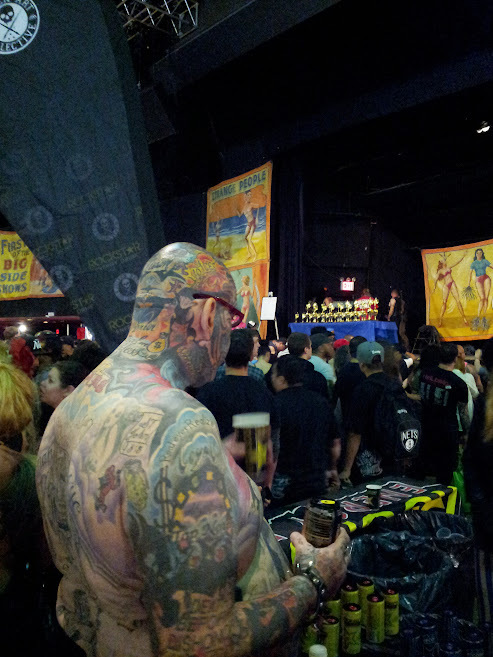 The second day of the 2013 New York City Tattoo Convention flew by in a blur of images, fueled by the unlimited supply of free Rockstar energy drinks. What follows are some of the highlights, for me. Hanging out at the Sacred Tattoo booth, I chatted at great length with Adam France, who tattoos out of Red Tree Tattoo Gallery in Columbus, Ohio. Adam was tattooing earlier in the week out of Sacred, in a guest spot, and was soaking in the atmosphere of the show. Aside from appearing in a recent episode of America's Worst Tattoos (in which he covers up something bad with something amazing), Adam is part of the organization that hosts the Hell City Tattoo Convention. Adam is a third-generation tattooer, whose father and grandfather also worked in the business, albeit in much different times. As a disagreement between some a couple of female convention-goers broke out nearby, we laughed at the 21st century novelty of everyone's instinct not to intervene, but to document, as camera phones popped up like prairie dogs in the vicinity, trying to capture a whole lot of nothing, while convention security quickly diffused the situation. Such activity was very minimal and high spirits abounded. One of the first booths you see when you come in to Roseland is that of Brent McCown, of New Zealand. 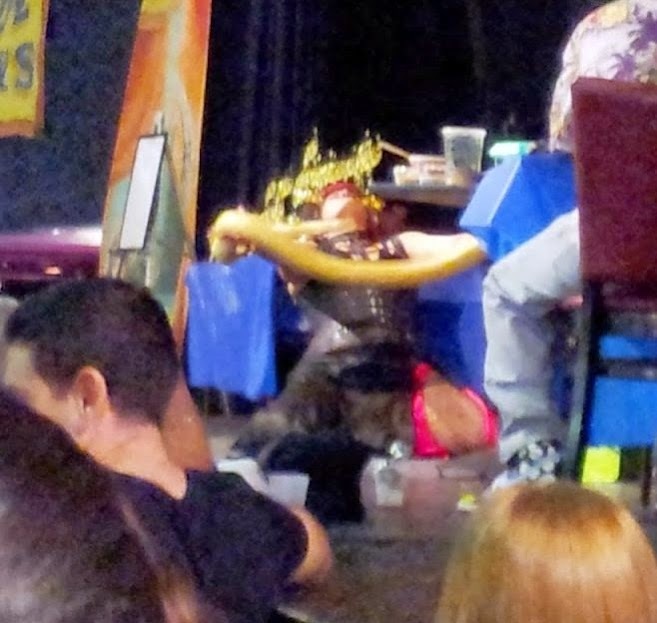 In case you couldn't tell, this performer is suspended and swing from hooks in her thighs and back. Ouch! What is so often lost in these events, is that you can really invest time in watching talented artists at work. Of course, in the real world, tattooists don't have the luxury of editors to abbreviate their performances for the viewing audience. So, it is great to come back and see your own time-lapse version of a tattoo's transformation over the course of a day or, is some cases, years. I got a chance to say hi to Becca and then got a hug from Kate when we ran into each other later on. Kate has a back tattoo that was featured here last year on Tattoosday. I've said it before, and I'll say it again: Can't wait to see the final product! Bad News Becca tattoos out of North Star Tattoo in Manhattan. I'll end on that stunning note and remind everyone that today is the final day of the NYC Convention, and Roseland is open from 12 Noon to 8 PM. It's a rainy day here in the Big Apple, so what better way to spend it than heading indoors and seeing some amazing tattoo work! 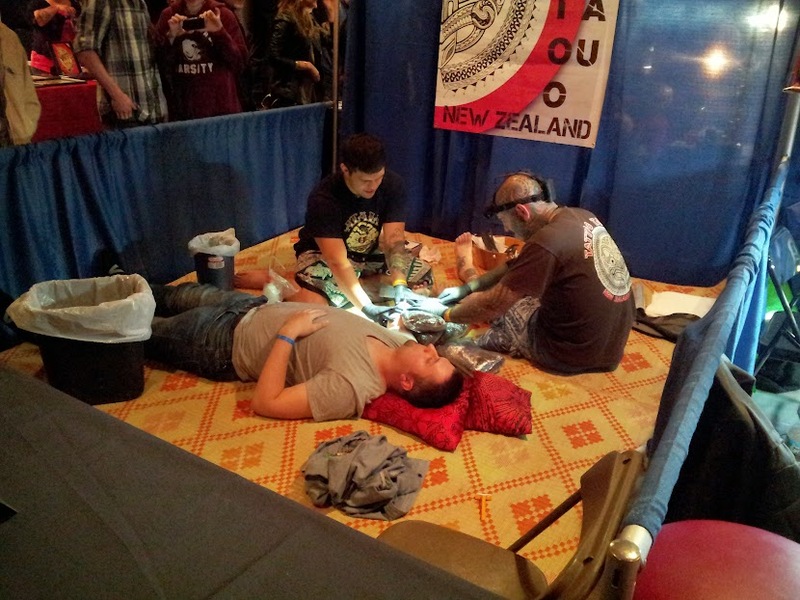 There's just something about the NYC Tattoo Convention that makes me smile. For the last five years I have attended and, despite the fact that a large majority of the booths are occupied by many of the same companies, there are always new changes and a grungy intimacy that make me happy I attended. I'm normally a "Saturday only" attendee, but I thought I'd give it an early go, and check it out Friday evening when things were just getting started. I still plan on spending a larger chunk of time there today, but I still wanted to get the lay of the land. No fancy convention center here, the Roseland Ballroom is a storied venue and its "lived-in" feeling contributes immensely to the intimacy of the event. 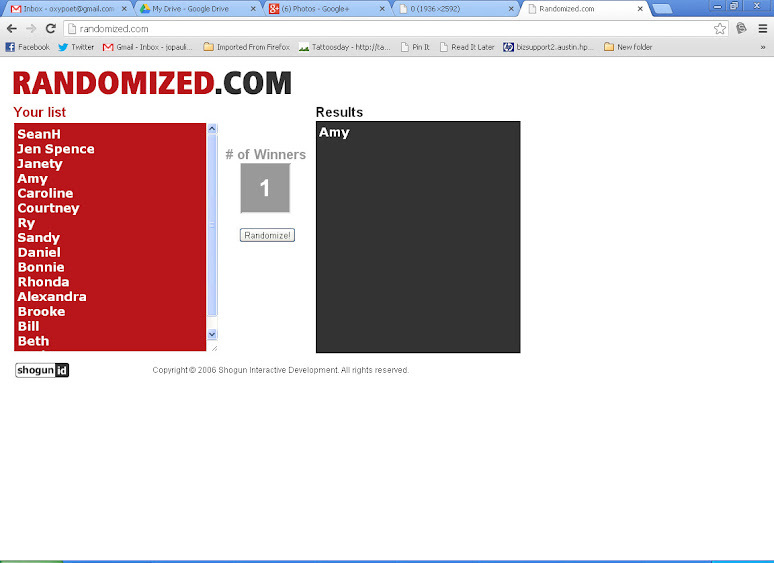 As always, Saturday's contests are a highlight of the show. There are trophies to be won! Not to mention that this year, the convention is a stop on the Inked Up World Tour, co-sponsored by Inked Up, Rockstar Energy Drinks and the Sullen Art Collective. There's a booth on the main floor where you vote interactively with a heavily-decorated model vying for "Miss Inked Up 2013" on which artist designed the best can for Rockstar Energy Drinks (I chose Nikko Hurtado's design), after which you get to spin their prize wheel. I got lucky and won a t-shirt! I swung by a whole slew of booths and will be back today to spend more time with the convention-goers. Of note, I met a nice woman at the booth of Independent Tattoo, who now has me thinking about getting a crab tattoo. And it was great reconnecting with Kevin from Sacred Tattoo and catching up. 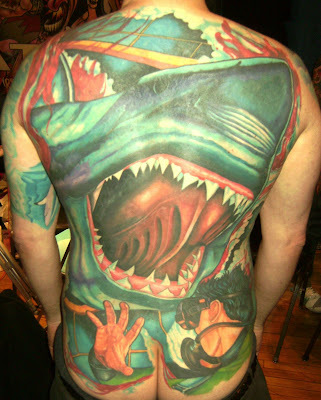 There is plenty to see, and I have only begun to covet my neighbor's tattoos! If there's anything that will give you a sense of ink envy, it's attending a show where the majority of the people are so dedicated to decorating the skin of others, or filling up their own personal canvases. Of course, for me, it is also about finding great people to interview for upcoming installments of Tattoosday. This PHENOMENAL piece belongs to Hannah, and was created by the amazingly-talented Shawn Barber. I will devote a separate post to this in the coming week, but talking with Hannah, and having her so generously share work from a talent like Barber, was just one of the reasons I left Roseland last night with a huge grin on my face. There may be bigger and brighter conventions, but the New York City Convention will always hold a place in my heart. I will be there today, as well, and will be posting on Facebook and Twitter (@Tattoosday). Doors open at 12 Noon and close at Midnight. The show also runs Sunday, May 19, from Noon to 8:00 PM. Thanks again to the organizers of the NYC show for always doing such a great job in putting together the event! 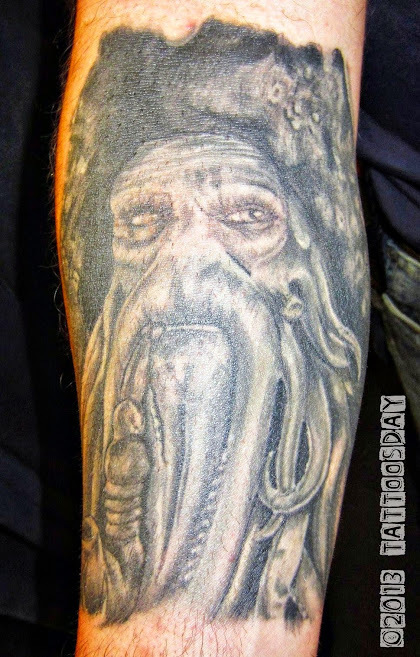 "I'm going with a nautical theme on my arm," he explained, and this depiction of the fictional sea captain Davy Jones anchors what is sure to be an awesome sleeve of the high seas. This excellent work was done by Steve Woisin at Studio 520 in Oakdale, New York, out on Long Island. We have previously featured this amazing work by Steve three years ago on the site. Thanks to Dave for sharing this awesome tattoo with us here on Tattoosday! Well, it's that time of the year again! It may not be the biggest, but it's OURS, and I've never had a bad time there. This will be my fifth consecutive year attending and I'm never disappointed by the variety of artists and the sheer entertainment of the event. You can see all convention-related posts under this tag. All convention details can be found on their website here. Or their Facebook page here. Stay tuned this weekend for more coverage from the show! 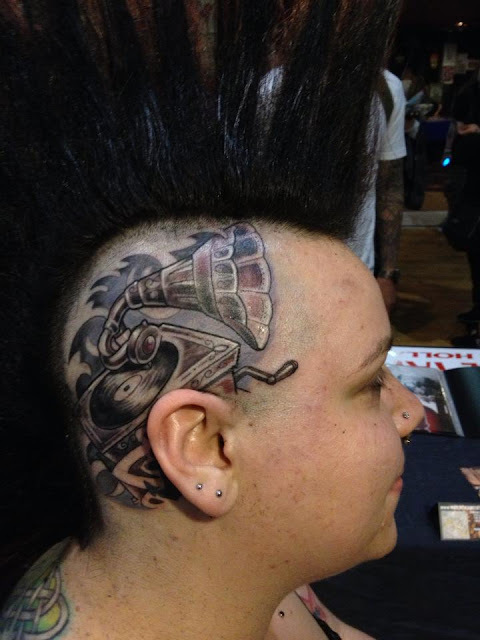 Congratulations to our reader Amy, who won the Brooklyn Tattoo contest! .And, remember, we are giving away copies of Phil Padwe's Mommy Has a Tattoo and Tattoo Coloring Book #2. You have until Thursday to enter by leaving a comment on the original post here, or on the Tattoosday Facebook page (here), or by e-mailing tattoosdaycontests@gmail.com.